Elevated between 5000 ft and 11417 ft, the Ski Resort is the highest elevated Ski Resorts in Italy. The vertical drop from summit to base is 6417 ft. The average difference in altitude between base and summit of Ski Resorts in Italy is 3087 ft. Most runs are therefore relatively long. Breuil Cervinia - Valtournenche is the the best rated ski resort in the Aosta Valley. It is among the 3 most family-friendly ski Resorts in the Aosta Valley. Season starts on Oct 27 and ends on May 5 (190 days). Average season duration in Italy is 130 days. Average snow depth during the season (Oct 27 to May 5) is 70 " at summit elevation and 20 " at base elevation. Snow coverage is usually best during May, offering an average snow depth of 126 " at summit elevation and 11 " at the base. Therefore Breuil Cervinia - Valtournenche is among the 10 ski Resorts with best snow conditions in Italy. Breuil Cervinia - Valtournenche features 89 sunny days on average per season. The average for all ski Resorts in Italy is 96 sunny days. April is the sunniest month with an average of 19 sunny days. Offering 93 miles of slopes and terrain, Breuil Cervinia - Valtournenche is among the 10 largest Ski Resorts in Italy. 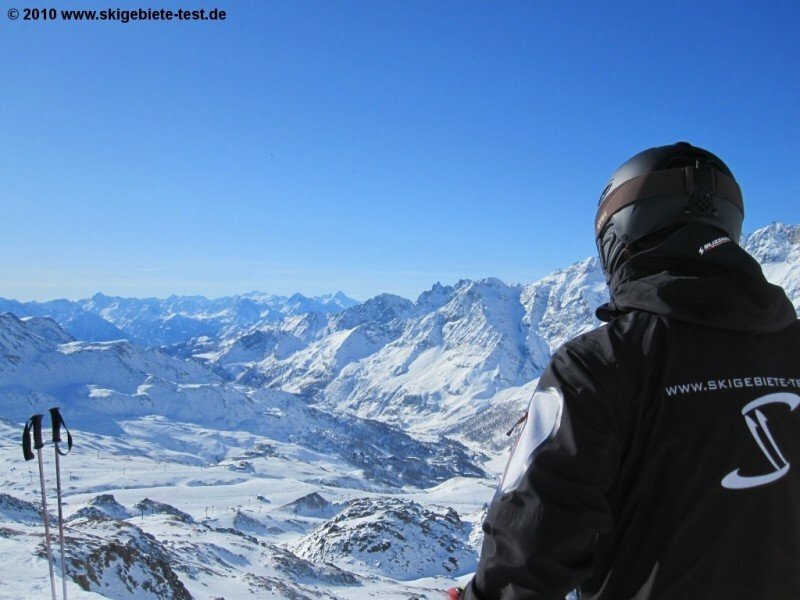 Together with Zermatt, Breuil-Cervinia is one of the largest ski areas in the Alps. From the Klein Matterhorn at 3,883 meters down to Valtournenche at 1,524 meters, almost 150 kilometres of slopes are spread over 72 varied runs. If you also count the trails in Zermatt, skiers can enjoy an incredible 360 kilometres of immaculately prepared slopes. Breuil is particularly popular with advanced skiers. 100 kilometres of red-marked runs require good fitness but also offer passionate skiers rewarding terrain and some incredible views over the enormous surrounding mountains. The well-known Pista del Ventina, which starts on the Rosà Plateau and leads skiers through a breath-taking landscape down into the valley by Cervinia, is undoubtedly one of the highlights. On this 11-kilometre run down to the base station in Cervinia, you pass through different levels, ski past the Cime Bianche Lahgi middle station and through the Bardoney area which features a technically-challenging passage which will certainly make your legs shake. If you enjoy history, then you should check out the runs on the Colle del Theodulo, as these lead down to Zermatt and were used as early as the 16th century as trading routes. And if you need a real adrenaline rush, look no further than the runs around Cieloalto. The steep forest trails which held World Cup races in the 1970s require the utmost concentration and technical skill, making them the perfect place to practice slalom technique. However this isn’t only a great destination for Alpine skiers, freestyle skiers can also really let their hair down here in three excellent terrain parks. The Indianpark in Cervinia offers numerous features like rails and kickers across four hectares of space, specifically designed for adept skiers and snowboarders or those working to become one. Beginners can try their first tricks at the Cervinia Cool Park in the valley area around the Campetto chairlift, and they can look forward to four small kickers, two butter boxes, a mini-pyramid and a boardercross course. Youngsters will love the Wild West Zone at the La Salette gondola. A magic carpet lift transports kids to the playful park featuring Indians and cowboys, a snowtubing course and a skicross route. Kids can also let off some steam in special practice areas like the Plan Maison located at 2,500 metres above sea level. Here, there is a themed trail with comical figures and a child-friendly magic carpet lift, which makes skiing a magical and fun experience for the young ones. And if you fancy getting your fix of winter sports during the summer months, you can enjoy 5.5 kilometres of prepared groomers in Breuil-Cervinia. And if that isn’t enough, you can explore a further 21 kilometres of runs in Zermatt. 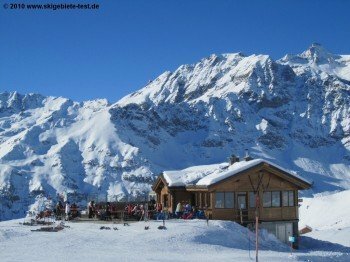 Across the entire Breuil-Cervinia ski area, you can expect to find excellent lodges and mountain restaurants to keep hunger at bay. Indeed, you can enjoy fantastic 360° panoramic views in the Rifugio Guide del Cervino at almost 3,500 metres. Depending on whether you would like to have a quick bite and return to the slopes or enjoy more of an extended lunch, you could find something you fancy in the self-service section or instead opt for the à la carte restaurant with typical Aosta Valley cuisine. On the Rosà Plateau, directly next to the Bontadini chairlift, you will find the Ristorante Bontadini, which offers delicious local specialities such as cheese fondue, home-made gnocchi and ravioli. And to top it all off, this restaurant has a huge panoramic sundeck. In addition to the exhilarating runs on Plateau Rosà and Cime Bianche, the almost 20-kilometre trail from Klein Matterhorn to Valtournenche, the Reine Blanche, is an unforgettable experience that’s not to be missed. The run down into the valley is rated as a red piste throughout and one of the most beautiful valley descents anywhere on the continent. The Gran Roc is one of the most difficult runs in Breuil – it couldn’t be much more black-rated and is a real challenge for any skier. And if you want to enjoy some time away from the slopes, you can pull on some snowshoes instead or explore the backcountry on a ski tour. From Plan Maison there is a 6-kilometre intermediate route which leads to the lift station on Cime Bianche or a tour to the Fornet chairlift, which is 4.5 kilometres in length. Fans of Nordic skiing will also enjoy the stunning circular cross-country route which starts directly on the edge of Cervinia town. Moreover, 10 further kilometres of cross-country trails are waiting to be discovered in neighbouring Valtournenche. A more action-packed choice would be taking a spin on the natural ice cart track on the edge of Cervinia or even an ice climbing tour up some frozen waterfalls. Daring winter sports fanatics should not pass up the chance to go heli-skiing. Accompanied by experienced mountain guides, you take the helicopter directly to untouched powder slopes. The largest and highest glacial cave in the world is also well worth a visit at the Piccolo Cervino gondola station. You can access this fascinating complex of caves via a 50-metre tunnel. These caves are some 15 metres below the surface and appear almost mystical thanks to the well-designed lighting and sound installation – a must for all visitors to Cervinia. In the centre of Cervinia, après-ski fans will find a wide variety of bars, pubs and restaurants that offer up plenty of choice after a day on the slopes. In the Yeti Bar next to the Cretaz lifts, you can get your evening kicked off on the right foot with snacks and drinks. You can alternatively hit the bars directly from the slopes in the new bar at Principe delle Nevi (Alpe Giomein), which boasts a lively atmosphere and a generously-sized sun deck. Café Le Samovar is cosy and relaxed. You can watch the hustle and bustle on the streets of Cervinia over a cup of hot chocolate and a piece of their delicious home-made cake. As soon as you have traded in your skiing kit and helmet for casual eveningwear, head over to the Copa Pan for something substantial. In the bar above the restaurant you can unwind from the day on the slopes with a glass of wine or beer, before heading downstairs into the restaurant’s elegant atmosphere for some delightful international cuisine. There is something for every taste in Cervinia. Connoisseurs head to Snowflake, which belongs to the Hotel Principe delle Nevi and serves up modern Italian cuisine with exclusive wines. Head chef Frederico Zanasi uses high-quality ingredients from the region to create top-notch dishes. Metzelet in the heart of the town is designed to look like a mountain chalet. Whether you opt for a spot on the large terrace, which offers outstanding views of the mountains all year round, or in the cosy fireplace room, the seasonal local specialities and dishes like Swiss cheese fondue or raclette always taste fantastic. If you prefer outstanding steaks and pizza directly from a wood-burning oven, head over to Jour et Nuit. Cervinia is located in the Aosta Valley which can be accessed via motorway A5 Torino/Aosta. You reach Breuil-Cervinia via the Châtillon/Saint-Vincent exit and then take a regional road for the last 28 kilometres. If you’d prefer to travel by train, Châtillon/Saint-Vincent is the end of the line. From there, you can catch regular scheduled buses to the ski area.